Nearly 1,000 people attended a memorial service for three young men with ties to the Menlo Park Fire Protection District who died in a crash in unincorporated San Mateo County on Halloween night. The memorial was held at Nativity Church in Menlo Park on Thursday evening, according to fire district officials. 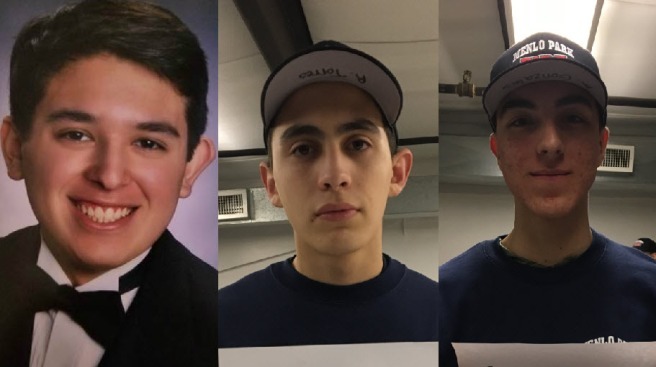 The three men, Matthew Cruz, 18, of Redwood City, Andrew Gonzales, 18, of Menlo Park and Ricardo Torres, 19, of Redwood City were found dead in a 2010 Hyundai on the morning of Nov. 1. The Hyundai apparently crashed sometime overnight on Highway 35, also known as Skyline Boulevard, after falling down an embankment, fire officials said. "The entire fire district family came out today to show our support to these families, while other fire crews from Redwood City, Woodside, South San Francisco, Central County and San Mateo County Fire covered our fire stations and emergency calls during the two-hour service," Fire Chief Harold Schapelhouman said. The chief said contributions from a GoFundMe page to pay for all three funerals exceeded expectations. In addition, Facebook donated two 50-person buses to transport individuals from the church to graveside services at Skylawn Cemetery on Thursday. Cruz's father Gary Cruz has proposed that a guardrail be built on the stretch of road that the trio crashed their vehicle so other families don't need to go through what he and his wife are. Torres' parents and relatives of Gonzalez have also expressed support of Gary's idea and working with CalTrans and the county to make it happen and have started a separate GoFundMe page to raise funds for it. "The families feel that if the guard rail in that location along Highway 35 would have been in place, the outcome may have been different and their children could still be alive today," Schapelhouman said. When the three turned up missing the night after Halloween, family members went searching for them. The search party found vehicle with its roof crushed at the scene, fire crews said. Torres was the son of the Rudy Torres, the fire district's master mechanic. Torres and Gonzales were Fire Explorers with Post 109, a Menlo Park Fire District program. Torres was also part of the South Bay Regional Fire Academy in San Jose, Schapelhouman said. "Both Ricky and Andrew had the drive and level of commitment needed to become firefighters. The untimely loss of these two young and talented individuals has shaken the other explorers," said Fire Engineer Eric Mijangos, who manages the Fire District's Explorer Program. Fire officials said Cruz spent three years in the San Mateo County Sheriff's Activities League Leadership Council and Mentoring program and worked with deputies and staff to improve the North Fair Oaks community. Sheriff's officials were on hand at Thursday's service. Cruz attended kindergarten with Torres and high school with Gonzales. The three friends were always together, Schapelhouman said.